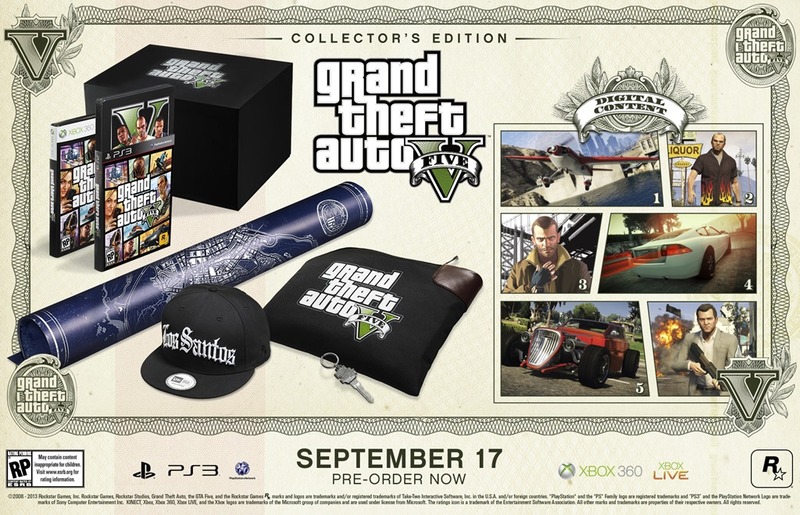 Grand Theft Auto V is about 4 months away from release and today pre orders for the Special Edition and Collectors edition go live, each boasting a fair amount of exclusive content. 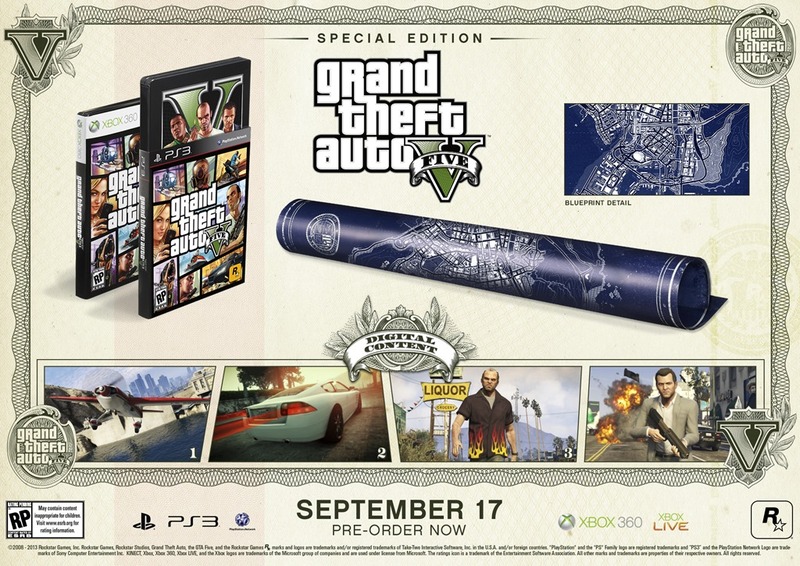 Before we look at the special editions Rockstar have also added something for the people who have pre ordered the standard game. Throughout the trailers and screenshots we have seen the skies of Los Santos filled with various aircraft, from helicopters to jet fighters and even a blimp, the ‘Atomic Blimp’ to be precise. With pre ordered copies of the game you will get access to the blimp with the ability to take control and fly it around as you see fit. Now my guess is that a few months after launch this and some of the other features that are in the Special and Collectors editions will become available for the rest of us either for free in an update or for a small price, but its still nice to have it from day one. Steel Book Case: Contained within a sleeve featuring the standard artwork will be a steel book case featuring some exclusive artwork on both the front and back. Additional Blueprint Map: This map will feature downtown Los Santos and surrounding Blaine County with special ‘cryptic’ markings that will show you the locations of interest and places to make a quick buck. Stunt Plane Trials: Along with everything else you will get access to additional single player stunt plane trials spread out across the map. Special Ability Boost: The special ability bar for each of the 3 protagonists will generate 25% faster. Outfits, Tattoos and More: All 3 characters will get bonus outfits in their wardrobe, character specific tattoos at the tattoo parlours and special deals from shopkeepers across Los Santos and Blaine County. Additional Weapons: In addition to the standard arsenal of mayhem, you will gain access to the Pistol .50, Bullpup Shotgun and a melee Hammer for free from AmmuNation stores in single player. All that content along with access to the Atomic Blimp is included with the Special Edition of Grand Theft Auto: V. If that isn’t enough for you then you could always check out the Collectors Edition. GTA:V New Era 9Fifty Snapback Cap: The cap features the Los Santos logo on the front with a black RockStar Games logo on the left and the V icon on the right, all with the quality you expect from New Era. Security Deposit Bag With Logo Key: A custom 10.75’’ x 8.5’’ money bag with pop up style lock and a custom laser cut key featuring the Grand Theft Auto Logo. Unique Vehicles and Garage Property: From the start of the game you will have access to a garage to store your custom cars. In single player the garage will be housing a 1930’s style HotKnife hotrod and a CarbonRS sports bike. Online you will get the high end Khamelion electric car. Like I said before I have no doubt that most of these things will be available for most players after a few months for a price but having them on day one will be nice. What we can take away from this though is that there will be some level of car customization, there will also be tattoo parlours, AmmuNation stores (even though we knew that) and chances are clothing shops will return. Also making a (probable) return is that little stats bar from San Andreas that showed your muscle, stamina etc. since one of the edition perks is a 25% faster generation on special abilities for each character’s development. We already know that getting fat isn’t possible in the game, as the current generation of graphics isn’t ‘as forgiving’’ But what other stats will reappear in the game. Only time will tell and on September 17th we will all find out.